Molt bona, m'agrada com has agafat la llum del cremador i la suavitat de la imatge. Nice shot! Beautiful light and colors! well captured!...you really got the balance just right between light and dark. Una llum espectacular , i jo no la vaig fer!!! ja em fas ràbia !! bona captura, aplaudiments: clap clap clap!!! Very colorful ... the sky is great. Impresionante, la foto y el procesado son de lujo. whoa! thats a pretty crazy sky to go hot air ballooning in. awesome shot! M'agrada molt, és un motiu ben interessant i a part, aquest desenfoc suau (o no) del rerefons la fa més atractiva. Wow, beautiful capture and treatment. I like the soft yet deep colors. Again! Beautiful subject, tones and colors! Marta, I'm making it more of a habit to check out your site everyday. It seems like your photos are getting more brilliant and compelling (is that possible?). I've never been so drawn to someone's photographs. Truly beautiful shots. 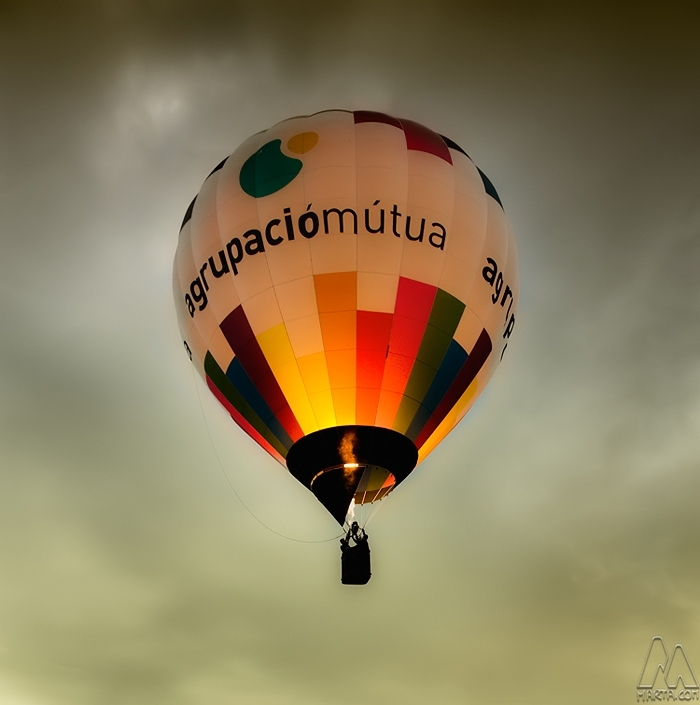 Very nice image, excellent with the blurry sky and the very sharp balloon. Like the strong colors too! Hermosos colores y una luz espectacular! Y también me encanta el cielo. Súper linda, Marta!! Terrific capture, Marta. I've always wanted to go up in one of these. So gern wär ich Phileas Fogg und würde in so einem Ballon über die Alpen fahren. lucky you to have that camera ready on time! Beautiful hot air balloon image. It glows from within!!! Beatiful picture, the dark clouds, the light of the flame. The balloon is really looking like a well lit latern. It sets itself apart nicely from the sky. I like this shot. Beautiful...looks like a giant light bulb in the sky. The glow of the balloon against the dark (but still not just grey) sky is fantastic! espectacular. un gran trabajo, una agrupaciónmútua de suavidad y luz que llena de magia esos colores. Klaus - 18-200. Leider musste ich leicht packen! Wonderfully composed and such beautiful color. Stunning! And a lucky snap! You definitely got great timing! Very vool, I love the way you can see the flame through the fabric of the baloon! Hasta el título está magníficamente escogido. this one is really awesome! wow! This is one of my favourits. Very nice!